Great style and performance is in the air with Nike Max Motion! For over three decades, Nike Air Max has influenced style and sport with its iconic look and cushioned comfort. Making sure to maintain the classic, visible air pod technology that gave Air Max its name, Nike has continued to innovate through new styles and inventive color combinations, while paying homage to the style’s original designs by Tinker Hatfield. The Air Max is different than all other lines of Nike sneakers because it makes the Nike Air visible. The Air Max line utilizes the latest comfort technology to ensure your feet are supported while not being dragged down by a clunky sneaker. It maximizes efficiency so you can remain active, all while keeping you fashion-forward. Today, Nike Air Max sneakers are worn by men, women and kids for everything from everyday shoes to personal style statements. There are a variety of Nike Air Max styles to suit every mood. Fan favorites include the Air Max Kantara with its cutout Max Air heel unit and sock-like construction. Explore all of Nike’s Air Max variations to understand the fit and design of each sneaker. The Air Max line is constructed with comfort and innovation in mind, so each sneaker is unique. You get personalized quality without having to pay the price! The Nike Air Max sneaker line is celebrated every year on March 26th, with Nike Air Max Day. This year we celebrate the 33rd annual Nike Air Max Day! The first ever Air Max, the Air Max 1, was released on March 26th, 1987. Each Air Max Day, we remember the original design by Tinker Hatfield and anxiously await a new edition to the line! 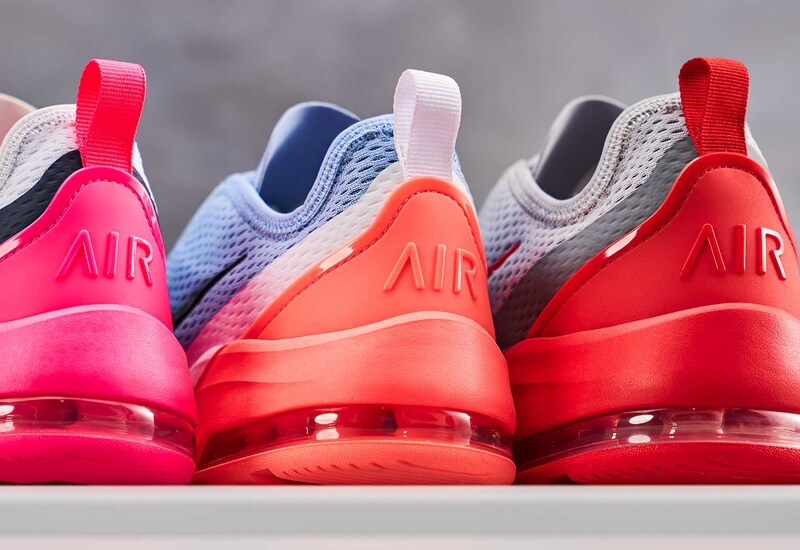 Off Broadway Shoe Warehouse is pleased to join Nike in the celebrations of Air Max Day 2019. This year’s Nike Air Max Day has a mission to give back to the community, announced by Nike in their new “Give Fresh Air” initiatives. The “Give Fresh Air” focus is aimed to give back to the community with the help of influencers and retailers. Nike is encouraging folks around the world to pay it forward, and we at Off Broadway Shoes are proud to support Nike’s initiatives! Other athleisure-inspired transformations of the Air Max style are the Air Max Motion and the Air Max Torch, featuring a cut-out section of the heel exposing the Max Air heel unit and the Air Max Motion 2 with its U-shaped Max Air heel unit. They make for an awesome, comfortable everyday styles but will help you stand out from the crowd when you’re looking to make a statement. Whether you are a sneaker-head, an athlete or a fashionista, we have the Nike Air Max sneaker styles to fit your taste at the best prices at Off Broadway Shoe Warehouse. Some of our women’s favorites include the Air Max Motion Racer 2, The Air Max Motion 2, and the Air Bella training shoe. Some of our men’s favorites include the Air Max Torch 4, the Air Max Motion SE, the Air Max Motion 2, and the Max Motion sneaker. Shop all women’s Nike Air Max shoes and all men’s Nike Air Max shoes to find your favorite, there’s a Nike out there for everyone!